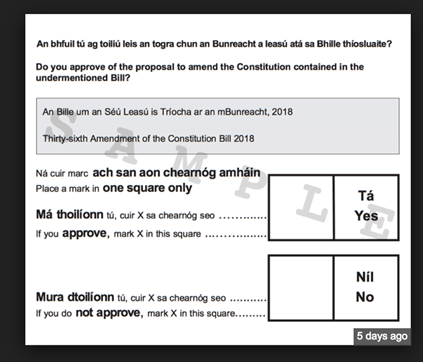 On May 25 all Irish citizens (who are registered to vote) will have an opportunity to vote on whether or not to allow the Oireachtas (the Irish Parliament) to legislate for abortion in Ireland. If the majority vote No, then the current constitutional and legislative framework remains in place, which allows for terminations of pregnancies only under very limited circumstances (where there is real and substantial risk to the life of the woman including the risk of suicide). If the majority vote Yes then the Oireachtas is free to introduce new legislation regulating the termination of pregnancy. The government has already indicated the sort of legislation it would like to introduce, though clearly that would be dependent on Dáil support, which is a big ask with this Dáil! The outcome may be clear but what is certainly not clear is the ballot paper we’ll be presented with at the polling station. It is hard to conceive of a ballot paper design that could be more confusing than this! But don’t let the ballot paper confuse what is ultimately a straightforward choice. Put simply, the choice on May 25th is over whether to vote No, and keep the current situation (of highly restricted access to abortion) in place, or to vote Yes, to allow the Oireachtas to introduce a more liberal abortion regime. Objective information about this referendum is available on the website of the Referendum Commission. A very worrying feature that has come to prominence in this referendum campaign more so than in any other is the lack of regulation of the internet and social media, which allows unscrupulous campaigners to use inappropriate surreptitious campaign methods to seek to influence undecided voters. (See here for more on this). We’ve already seen how this sort of activity played out in the recent US Presidential election and the UK’s Brexit referendum. We can only hope that this doesn’t unduly influence the outcome of this referendum. It shows, yet again, why Irish elections and referendums need to have a much stronger regulator in operation. The rather quaint, minimalist and cautious role provided by the Referendum Commission needs to be replaced by a well-resourced, professional and permanent Electoral Commission. Let’s hope that government inaction in this area to date doesn’t have unfortunate consequences for this referendum. This entry was posted in SPIRe staff and tagged Abortion, Referendum. Bookmark the permalink.